Marketing Manager by day, Plant enthusist by night. Instagram is one of the top social media tools that can help build your brand, gain a large audience, help you stay social with clients, and improve your Realtor marketing. In fact, Instagram has over 500 million active monthly users and 75 percent of Instagram users take action, such as visiting a website, after looking at an Instagram advertising post. Post a before and after picture of a recently renovated house, kitchen, living room, master bath, etc. Posting transformation photos will encourage your followers to improve their home or decide it is time to move. Insta-worthy food posts that highlight your neighborhood or cities dining experience are a must. Posting food that will make your followers drool over is an effective way to show your followers why your city is so great! This is another great way to show off your city. 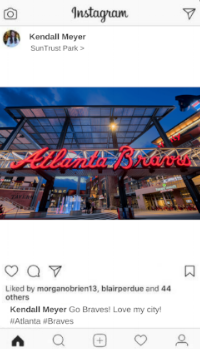 Post pictures of yourself at a Braves game, Hawks game, farmers market, etc. Show your followers all that the city has to offer! Everyone loves a good laugh and a great way to do this is to make fun of yourself. A good idea for this is to post some of the weird things you go through daily as a real estate agent. Capture the lifestyle of the city that you’re privileged to be apart of. Show off cute areas, neighborhoods or the city itself. Your followers are potential clients. By sharing tips and tricks it will show them that you are here to help. Post visual content of the title of your blog and post a link that will lead them to your blog. It’s a win-win! You get more traction to your blog and help your followers. 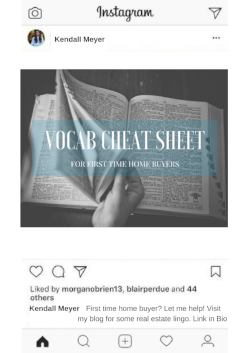 For example, post an Instagram of vocab cheat sheet for first time home buyers, how to improve your home for summer, plants to grow in the summer, etc. Ask your clients if you can post a picture of them in front of their new home. Show how happy your clients are when they find “the one” or when they’re leaving the closing table. Society’s attention span is on the decline, so they probably aren’t interested in watching a five-minute video, slideshow or panoramic tour. Instagram allows you to share up to 60 seconds of video at a time, which is plenty of time for your audience to watch a video highlighting the home. Instagram is more than just an app to post pictures of yourself with friends. It is a way to better market and brand yourself as a real estate agent. Be frequent and consistent in your posts and always remember to post things that will help your clients.